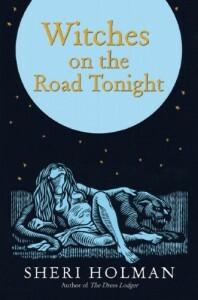 Witches on the Road Tonight has proven to be as enjoyable a read as Holman’s earlier efforts (The Dress Lodger and The Mammoth Cheese), and I am looking forward to the day when I move up to #1 on my library’s hold list for her first novel, A Stolen Tongue. Holman’s novels, so far, have reminded me in some ways of Sylvia Townsend Warner’s (which would explain why I like them so much). On the surface, the three novels I’ve read could have been written by three different authors – The Dress Lodger takes place in 19th century England and involves body-snatching, prostitutes, deformed babies and the early Industrial Revolution; The Mammoth Cheese takes us to the heartland of America in the first decade of the 21st century and has pedophiles, frustrated loves and the fate of small-town America on its mind; and in Witches, we focus on the story of Eddie Alley, from his childhood growing up in Appalachian Virginia just before World War II to his attempted suicide 60+ years later, and, oh, yes, his mother, Cora, who’s reputed to be a witch among the people living near Panther Gap. What they all have in common, though, are the themes of family and love and the price one pays to love. They also, as I’ve noted in earlier reviews, are ultimately positive affirmations. The best parts of the novel are those that take place during 1940 when Eddie’s about 12 and living mostly alone with his mother on a small farm in Appalachia (his father, Bud, is working for the Civilian Conservation Corp building roads). Tucker Hayes and Sonia are writer and photographer, respectively, hired by the Works Progress Administration to document rural America. While driving through the region, Tucker hits Eddie with their car, and the two wide up taking the young boy back to his farm, where they meet Cora. For me, these sections particularly were intense reading. The prose simply lifted me up and carried me away; much like Tucker feels when he dreams (?) that he’s being ridden like a horse by the skinless Cora. A lot of people will be disappointed by the ending. Holman leaves little resolved, and there’s little reason to believe that you know what happened back in 1940 or what happened in 1967 or 1980 or in the present day (the other threads of the narrative) but there are times when you want the ambiguity of Rashomon rather than the certitude of a more typical novel, and Holman successfully pulls it off here. “Wallis, my little girl. Love comes for us all. We run from it, we hide from it, but in the end it finds us where we are cowering. We creaky old monsters are returned to life. That’s why all the best horror movies have a sequel. “It really wasn’t necessary. Any of it. All of it.